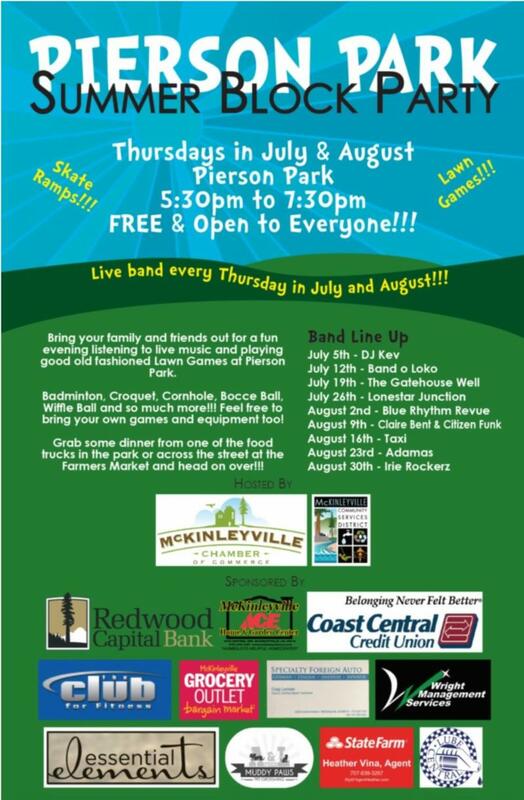 Join us every Thursday in July and August for a fun filled evening at Pierson Park! We have partnered with MCSD Parks & Recreation Department to bring live music and games to McKinleyville! Bring your lawn chairs, picnic blankets, ice chest with food and beverages, pick something up from the food truck or at the Farmers' Market at Eureka Natural Foods on your way to the park. A very special thank you to our generous sponsors who make this community event possible! Full Sponsors - Coast Central Credit Union, Grocery Outlet-McKinleyville, McKinleyville ACE Home & Garden Center, Redwood Capital Bank, Specialty Foreign Auto and The Club for Fitness. Co-Sponsors - Essential Elements Wellness Spa & Sauna, Lube Central, Muddy Paws, State Farm Insurance-Heather Vina and Wright Management Services.